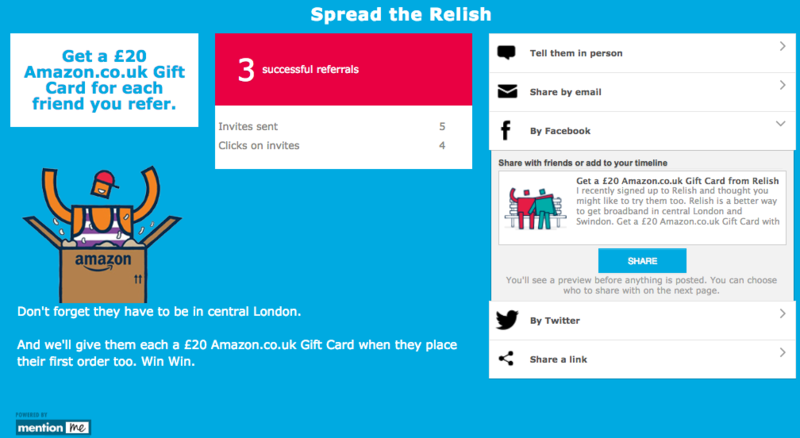 Here at Mention Me HQ we consider ourselves connoisseurs of refer a friend. 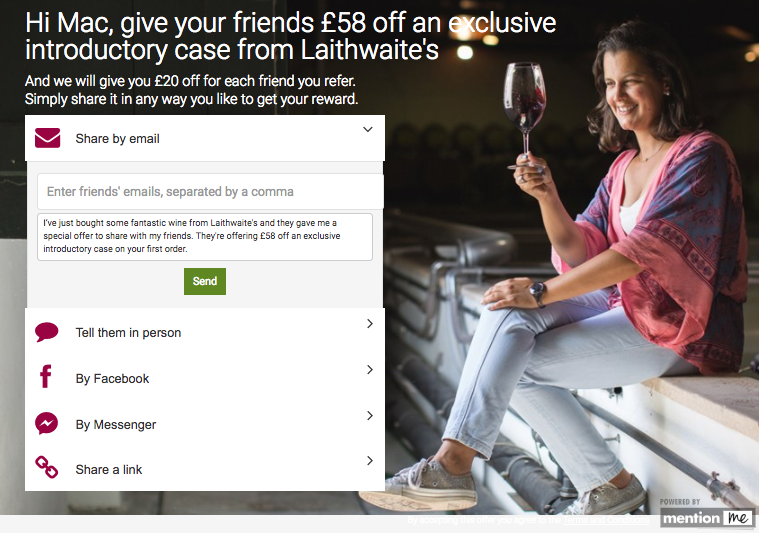 We’ve signed over 160 businesses globally to use our referral marketing platform and we’re proud to offer two industry leading features: the ability to AB test everything - even rewards - concurrently (harder than it sounds!) 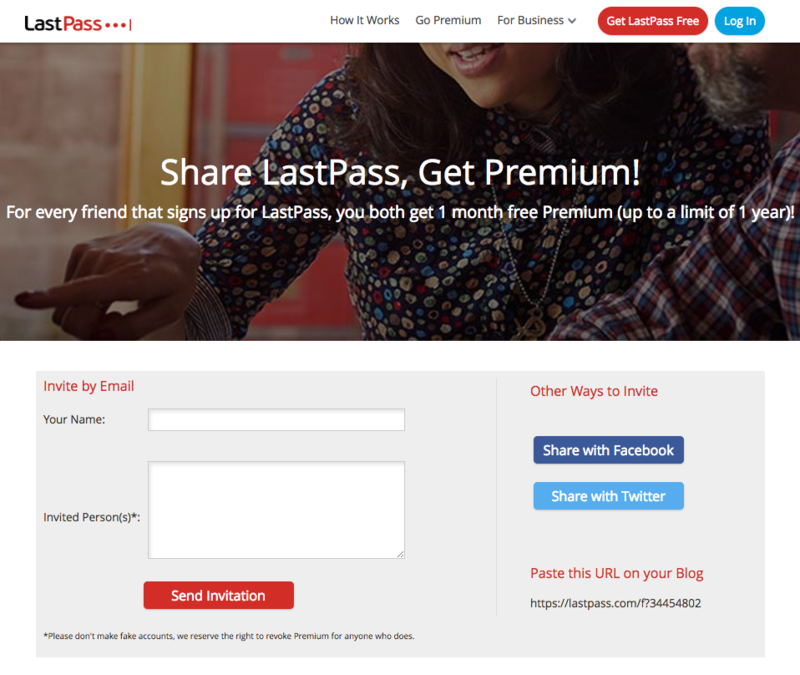 and the ability to encourage word of mouth and then track it back through online channels. 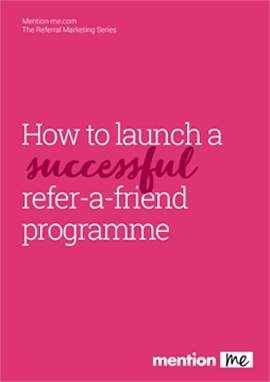 So, we spend a lot of time reviewing and optimising refer-a-friend programmes and there are some programmes that we admire from afar, holding them up as examples of best practice; while others are the ones that we’re proud to have brought into the world ourselves. If you ask your average UK resident there are some brands who are synonymous with referral marketing. Uber is normally the first to come to mind thanks to their amazing word of mouth growth over the past decade. 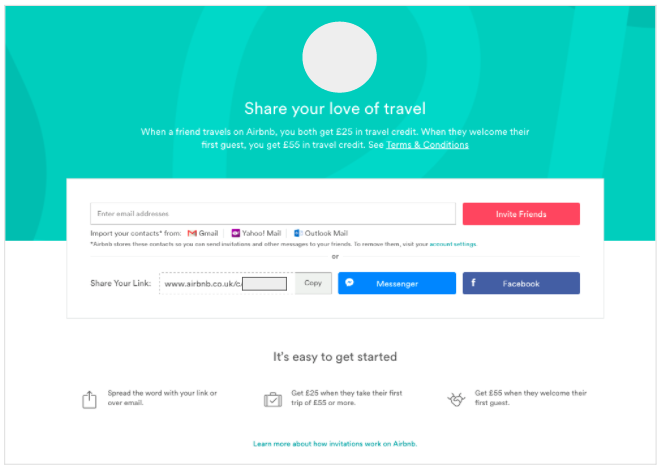 Airbnb and Dropbox are two other nascent internet brands who have made good use of the technique. 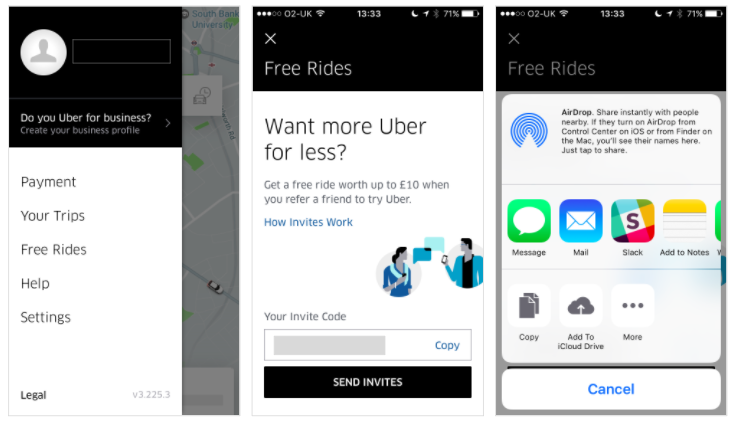 Like Uber, both have notably given away their own products or product credit as the reward. 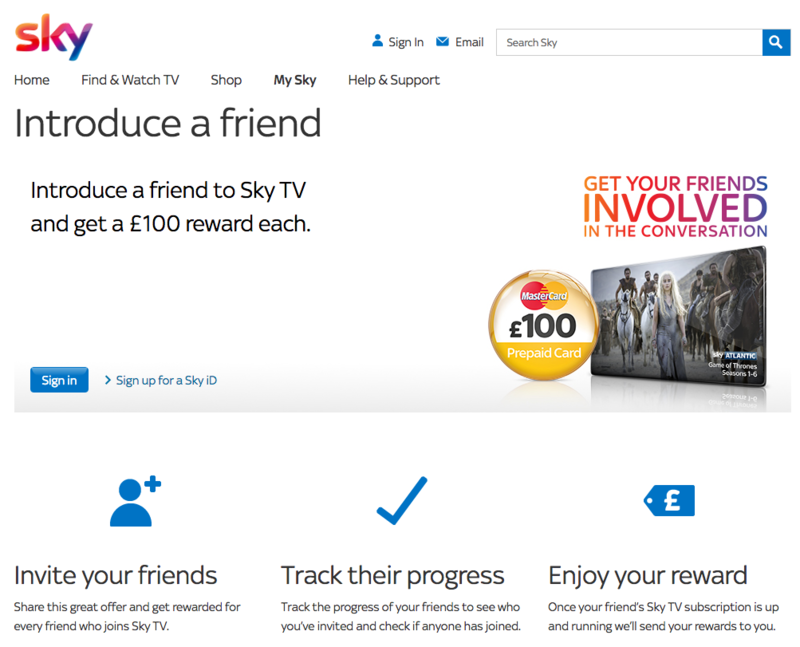 Nationwide and Sky are two other heritage UK brands who have put big advertising campaigns behind their referral programmes. These examples have tended to be used to gain market share in fairly saturated markets and the hallmarks of this strategy are higher value rewards and often the use of 3rd party incentives (e.g. a prepaid cash card or cash back). The mainstream ladies fashion market extends from high street to up-and-coming online fast fashion brands like Missguided. 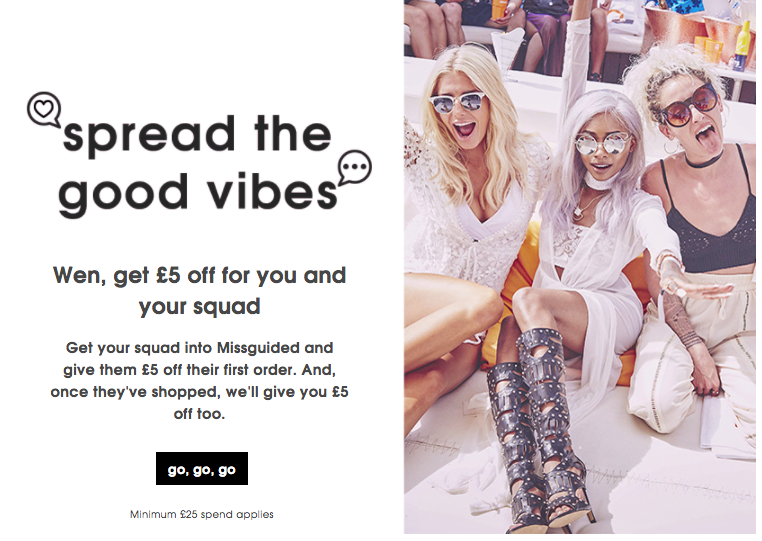 One of the main characteristics of referral programmes in this space is that while they don’t necessarily give away high value incentives they do still try very hard to capture the attention of fashion shoppers - in the two examples below: Lipsy and Missguided this is done with creative copy writing that talks to shoppers in their own language. You might think that some types of fashion would be too private to share but this is definitely not the case with ladies lingerie! 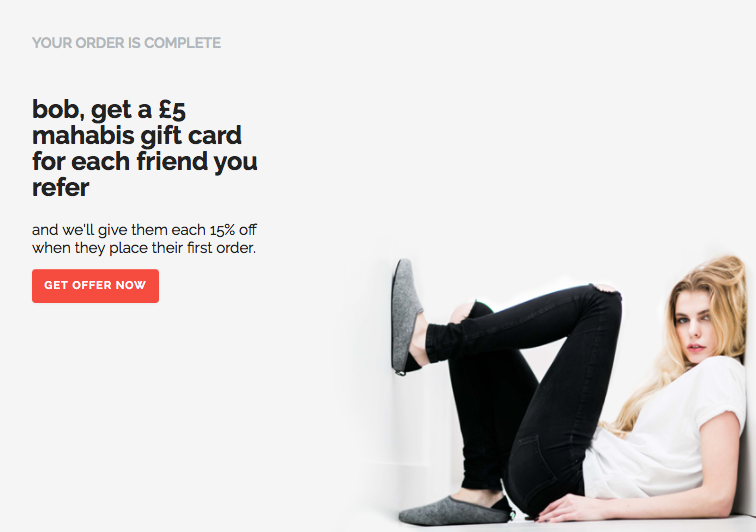 This subset of the ladies fashion sector is actually pretty commonly shared and there are some nice examples of referral programmes. 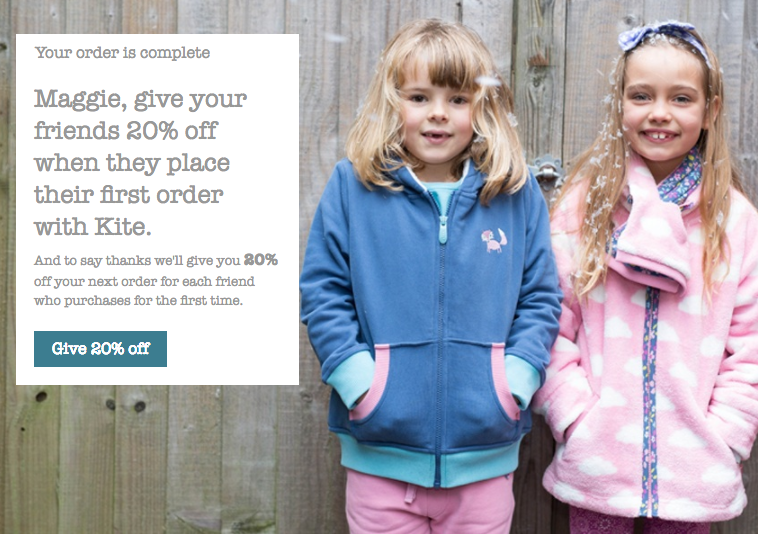 Both Boux Avenue refer-a-friend and Heist Studios refer-a-friend have decided to use reciprocal 20% off offers. Sharing is often done in the spirit of helping out a friend who is an unusual size or who is looking for a specific product. Luxury fashion, in our experience, is one of the most shareable sectors selling online today. The psychology of referral draws heavily on the idea of social standing. Sharing an expensive and trendy fashion item with a friend does so much to increase social standing - it's a natural fit. 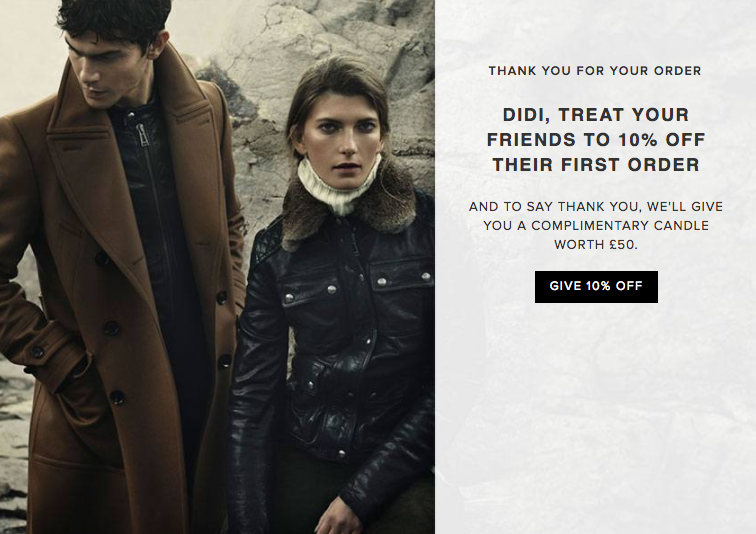 Because of the higher value of goods, brands in this space tend to offer lower introductory rewards, and some like the Belstaff example below offer free products or free delivery rather than discounts in order to maintain the very high standards of their brand. 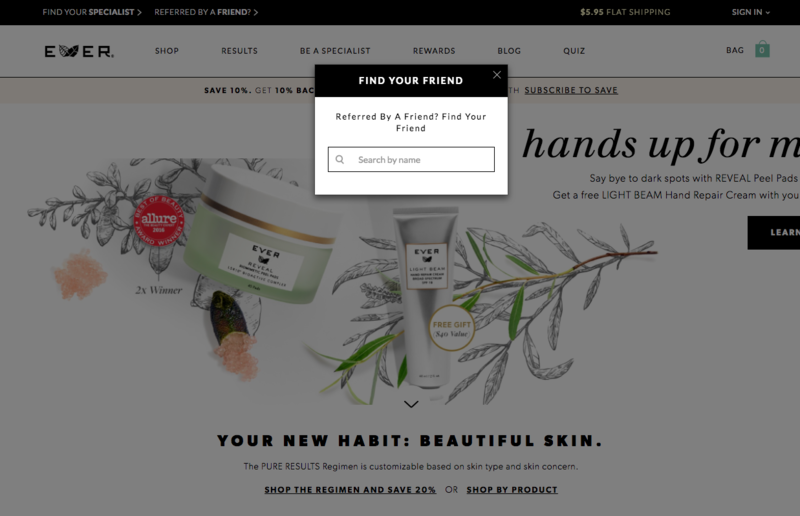 We’ve included an example of the translated refer a friend programme for Farfetch to make an important point - referral is not just for home markets. Luxury fashion brands get very high traction from their referral programmes in China, Korea and Japan. At Mention Me we’ve translated our customer journey into all the major asian languages and we’re happy to offer insights into running referral in these markets. 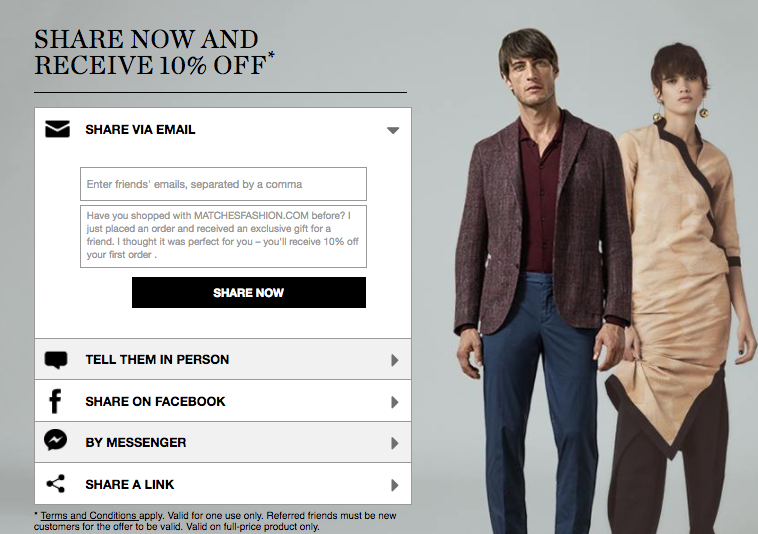 Our Farfetch Referral case study give some great insight into how referrals works in the luxury fashion sector. Men’s fashion shares many characteristics with women’s fashion - but with slightly less intensity. Men are slightly less likely to share than women in general and also less inclined to talk about fashion. 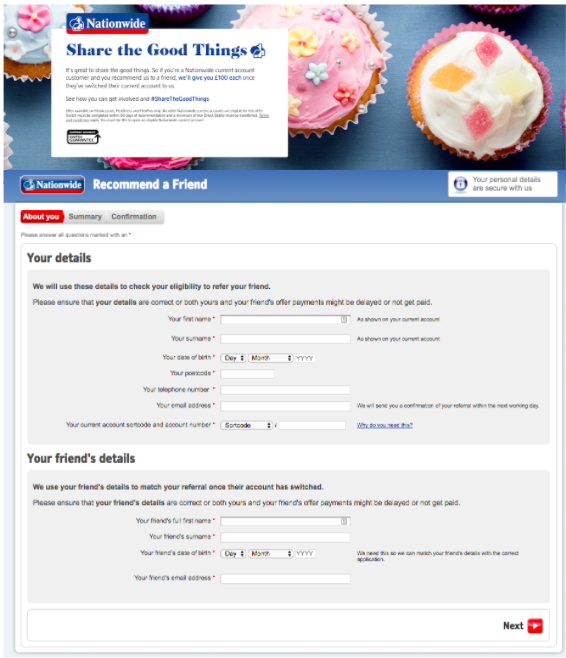 However there are some brands who make very good use of refer-a-friend to drive their growth. 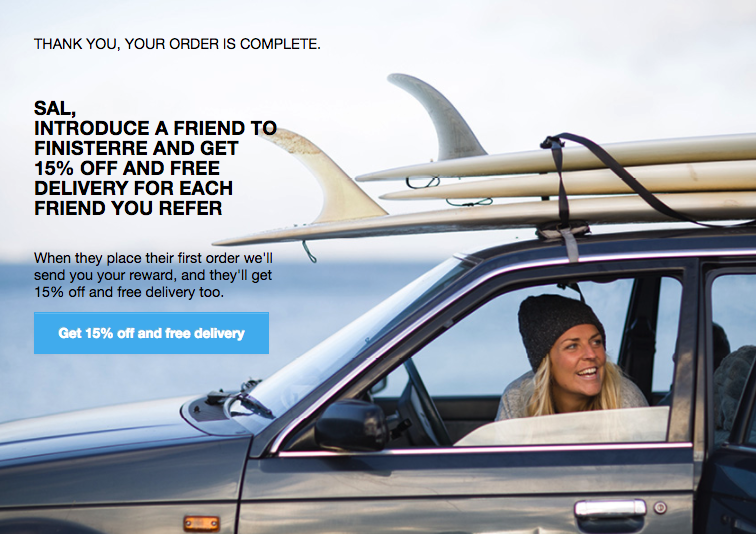 The Finisterre and the Enclothed refer-a-friend examples below are two great case studies - challenger brands with high emphasis on delighting customers who are using referral marketing to fuel customer discovery. 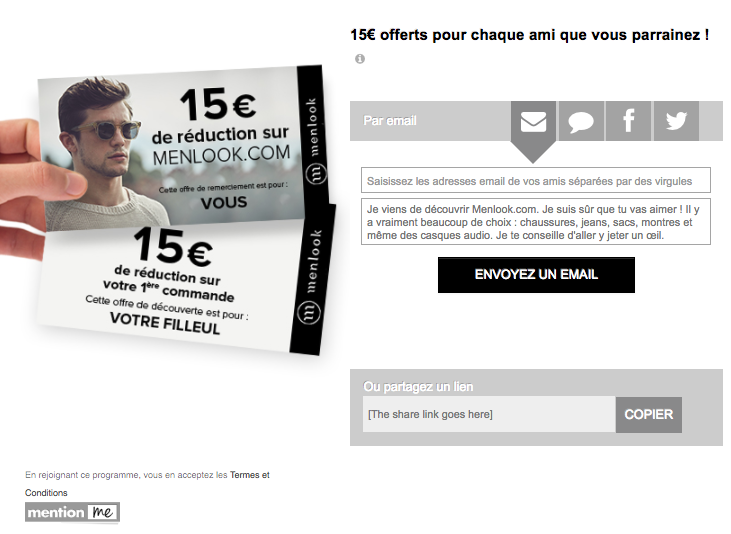 The last example in this section comes from the french Menlook website and shows how the referral experience can cross borders. 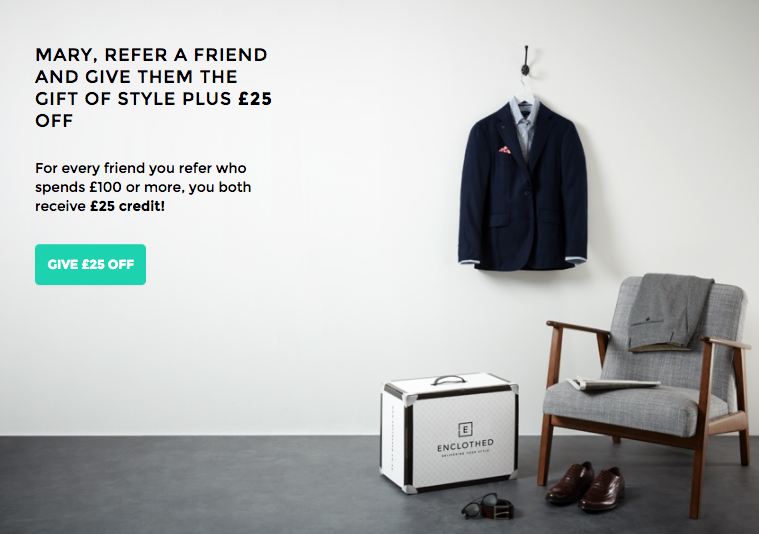 One of our recent mens fashion launches was for the Enclothed refer-a-friend scheme. This is a large product category spanning everything from footwear to handbags. We’ve featured a few examples from Mention Me below. The dynamics of each subcategory are quite distinct. For glasses, which have a long purchase cycle, it is optimal to offer a third party voucher as the reward because most purchasers don’t plan on buying new glasses again for over 18 months. 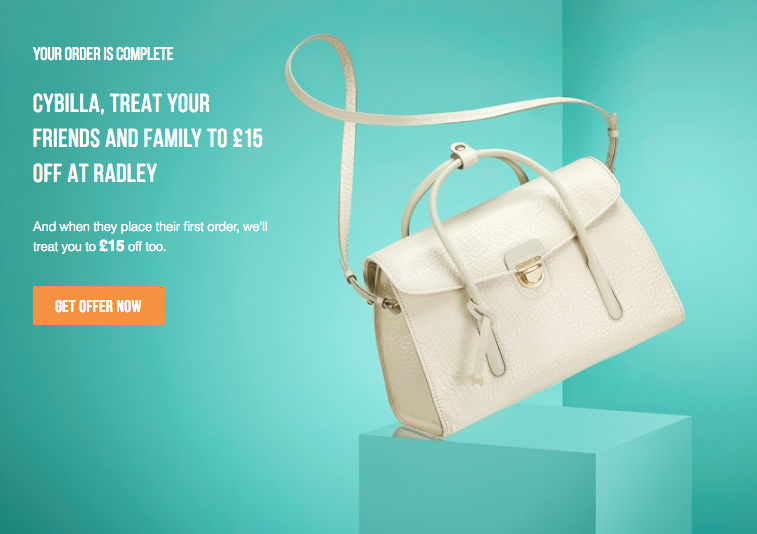 Radley and The Jewellery Channel have both positioned their referral offers as the opportunity to give a treat to a friend. 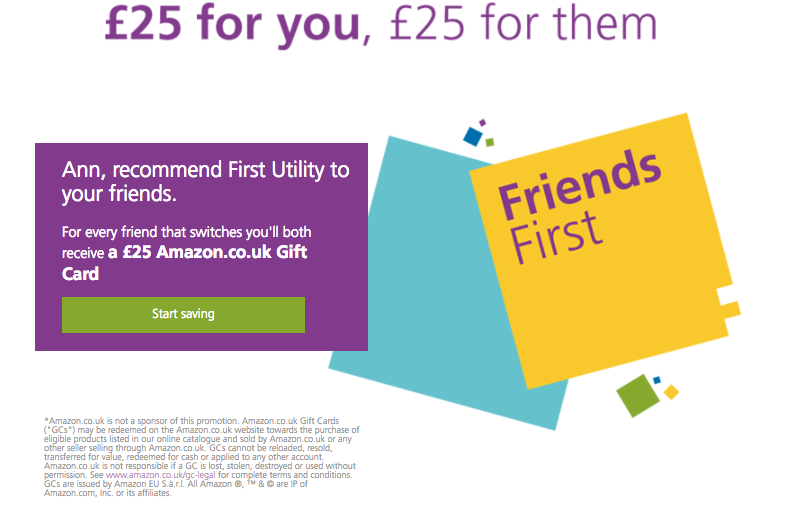 We call this a generous offer because it prioritises giving something nice to friend rather than getting a reward for oneself. 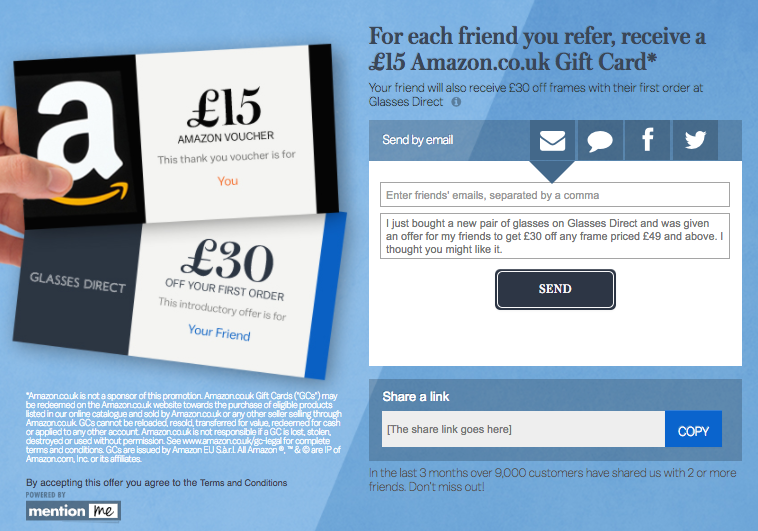 Glasses Direct were Mention Me’s first client and three years on their referral programme drives 30% of new customers acquired online. Read about their successful referral programme. 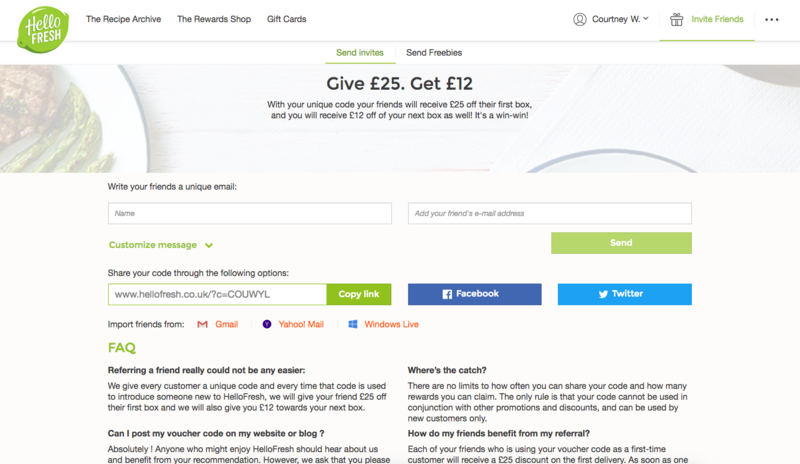 Software referral programmes are often a different breed than those for e-commerce retail websites. In many examples we found, the referral programme has been built in-house rather than by an outsourced provider. This has obvious benefits for businesses rich with engineering talent but can often be a blocker for other companies where engineering backlogs can extend to months and sometimes even years. 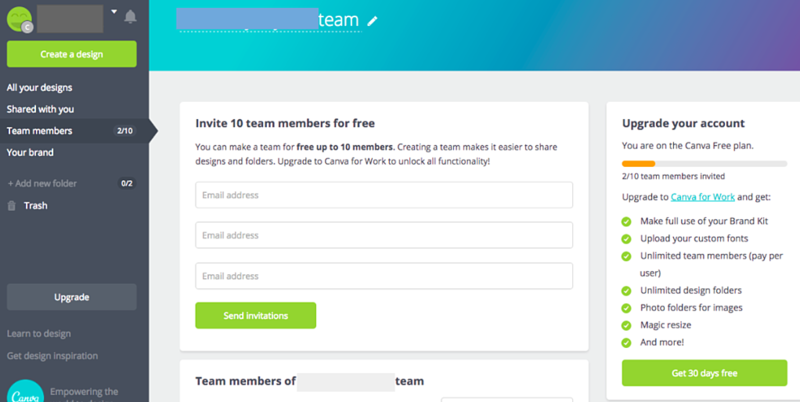 Canva and Trello both have sharing and team collaboration built deeply into their products so the process of inviting people to join you is very slick (as you might expect). 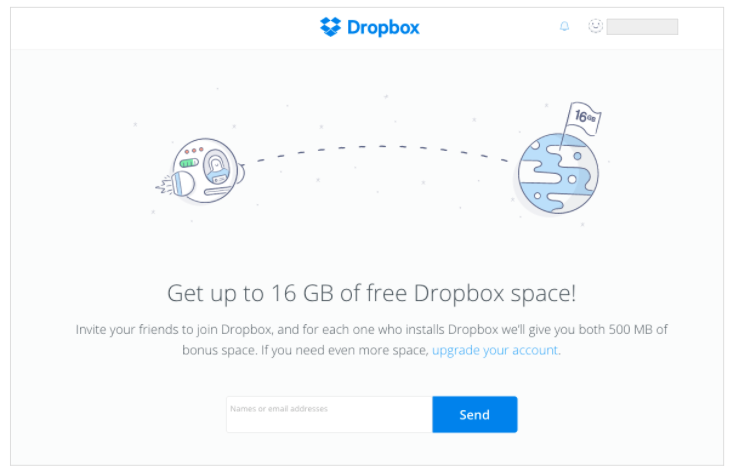 They all follow the Dropbox best practise and offer free product extensions as the incentive. This category is a mixed bag and you can read our blog from back in 2016 for more detail on referral in the financial sector. 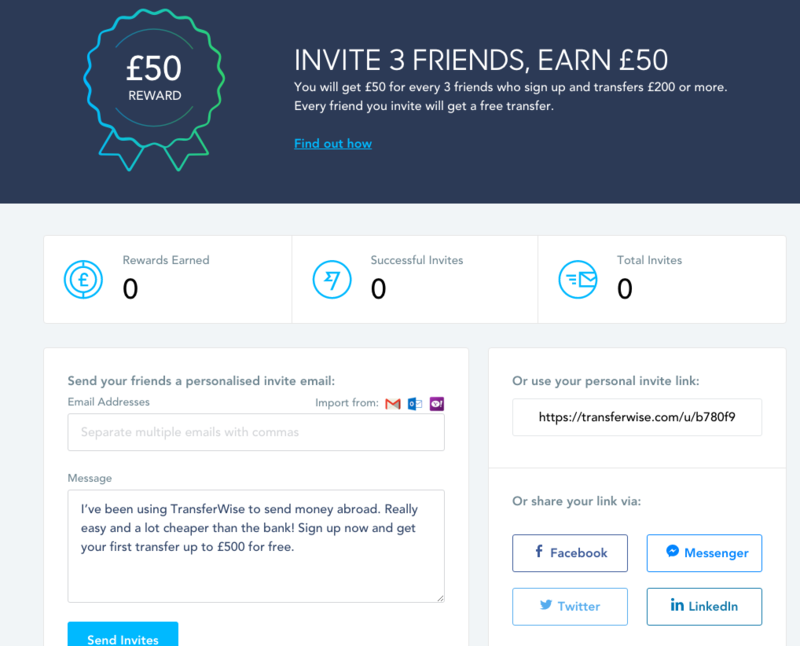 Some of the newer Fintech business offer very slick customer experiences, like in the Transferwise and Profile Financial example below. Incumbent brands like Amex and Nationwide however tend to suffer from under investment in the visual design of their offerings. 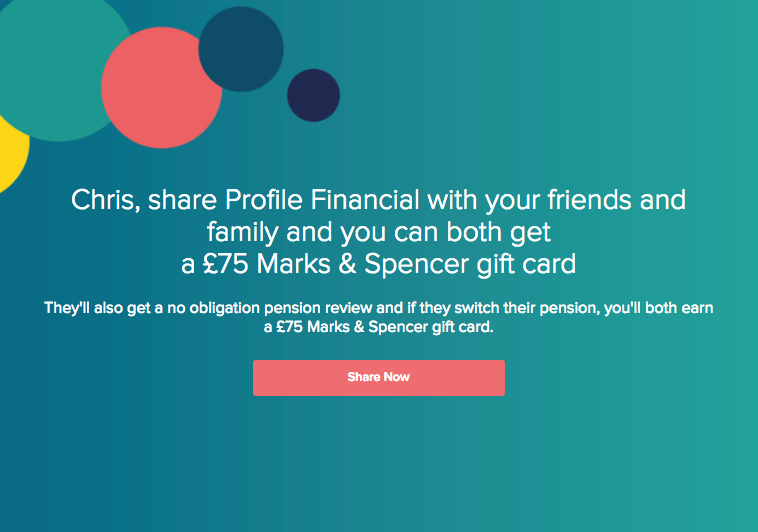 This sector was once famous for offering ‘free money’ for referrals but the reward types have proliferated in recent years and now it is common to see third party vouchers (like M&S or Amazon), loyalty points and credit on account. 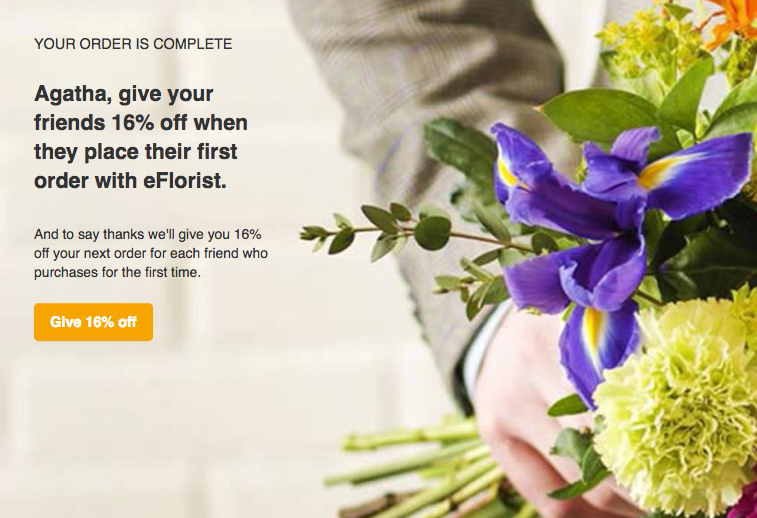 It’s common, however to see higher value incentives reflecting the higher lifetime value of these customers. 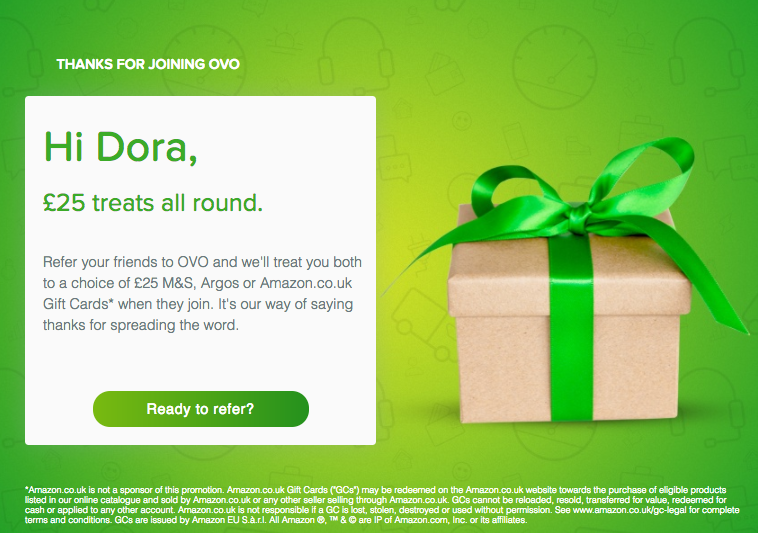 You can read more about our partnership with OVO in our case study. What a great sector for referral! 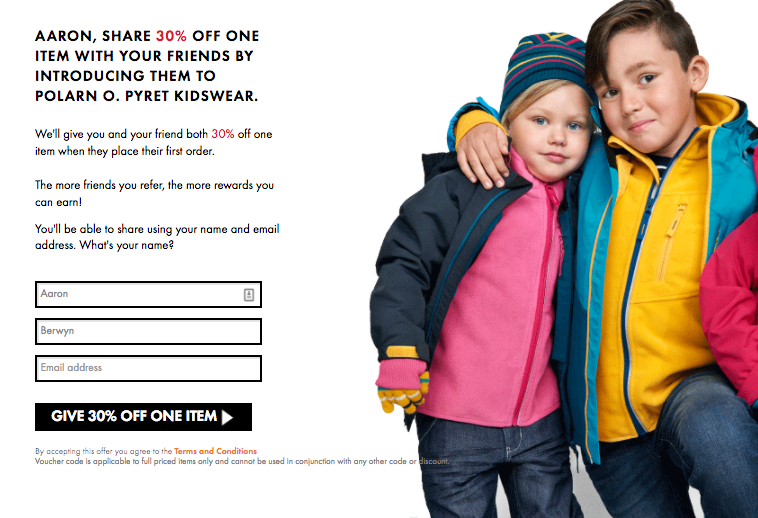 We regularly see some of the highest rates of sharing on the children’s brands which we work with. Could it be because nothing gives parents more pleasure than showing off about their kids? Or maybe it’s because parents strongly value the recommendations they get from other parents? Or could it be because we love to treat our children? We’re not sure - but we know this sector performs really well for refer-a-friend. 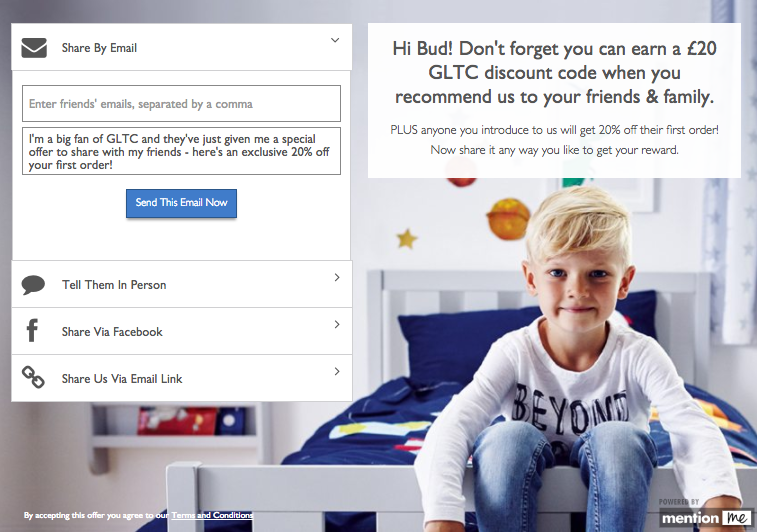 Mention Me’s patent pending name sharing functionality is the perfect fit for this sector (many kids brands see 40% of their referrals coming from it). 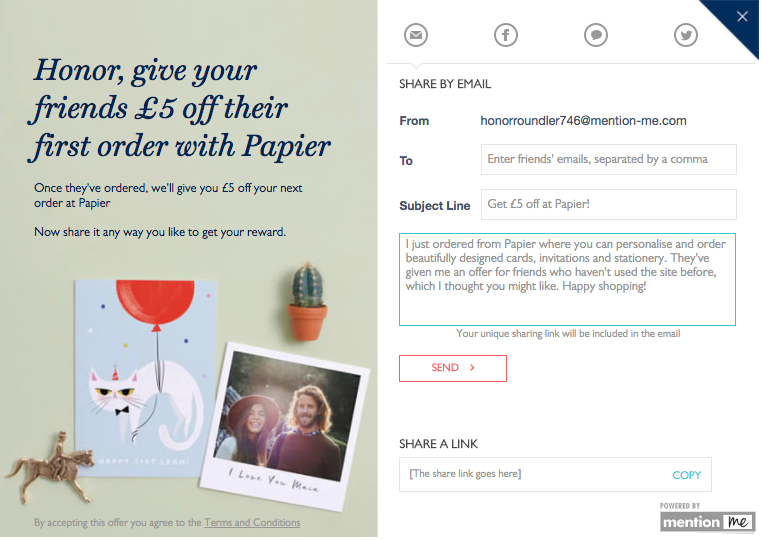 Share by name means that a recommender can say “Go to Kano and just enter by name into the checkout to claim your introductory reward.” The name replaces a link, email or social media interaction and means referral can be truly omni-channel. Beauty and wellbeing, much like fashion, is a sector that gets a lot of talk time with consumers so it is a great fit with referral. 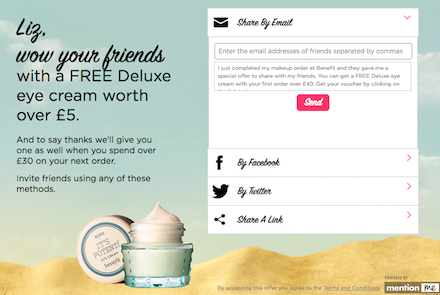 This is one area where using samples or miniatures as the incentive for sharing can work really well, as in the example from the Benefit refer-a-friend programme below. Here at Mention Me, we are very proud of some of the programmes we’ve launched in the past year: Laura Ashley, Habitat, Eve Mattresses and Emma Bridgewater all have referral schemes run on the Mention Me platform. 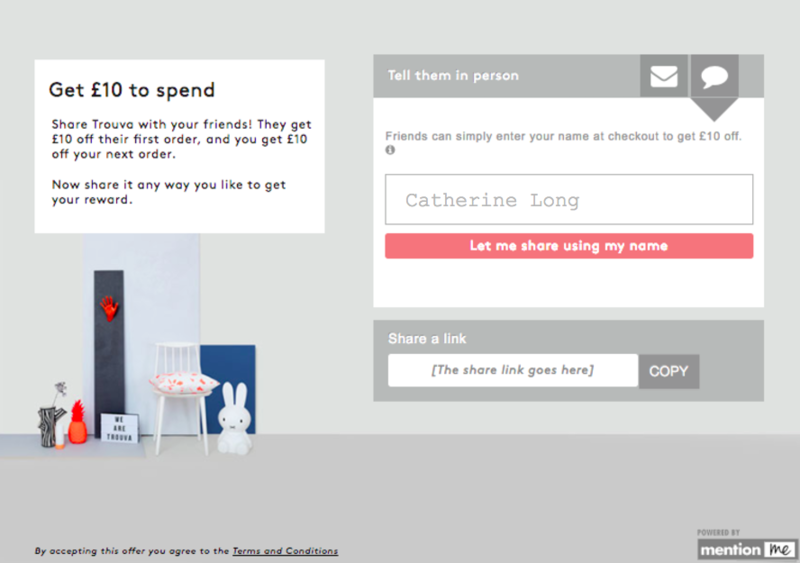 Laura Ashley serves the referral overlay after each order is completed. 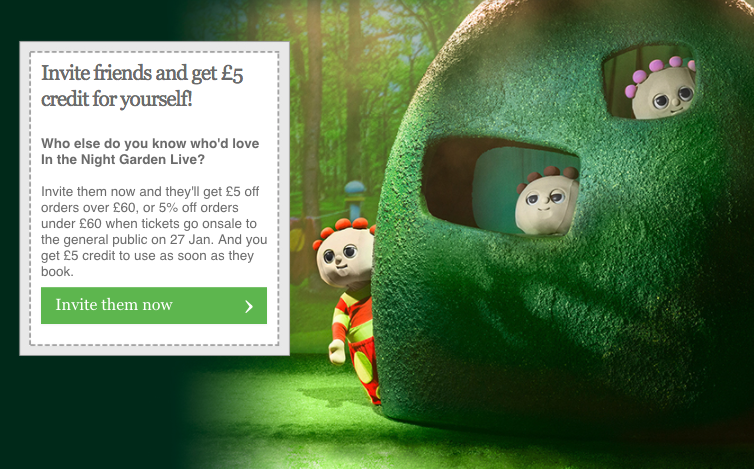 Should the customer dismiss the offer initially without sharing, it collapses down to a small reminder promo in the bottom corner of the webpage - a useful tactic for staying on customers’ radar whilst preserving the integrity of the user experience. 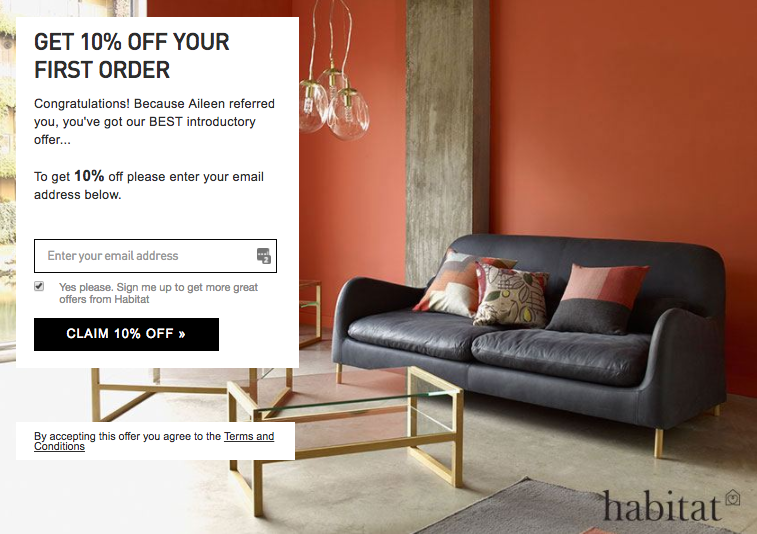 Habitat, like Laura Ashley only needs to offer a small value incentive (10% in this example) because the relative order values are quite high. Emma Bridgewater is a little different. Their brand fits very well with the generous psychology we mentioned a little earlier and so their messaging is around giving a gift to a friend and the incentive for a first order is to receive a free mug. Eve Mattresses is a beautiful example. 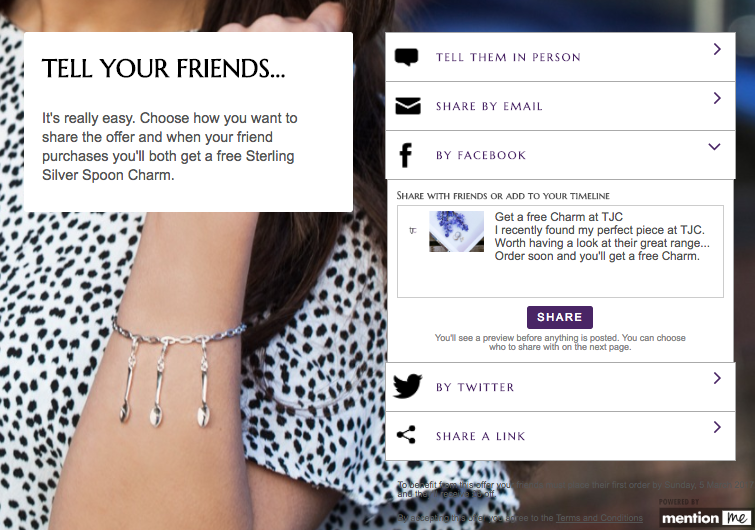 We love their designs both on mobile and on desktop! 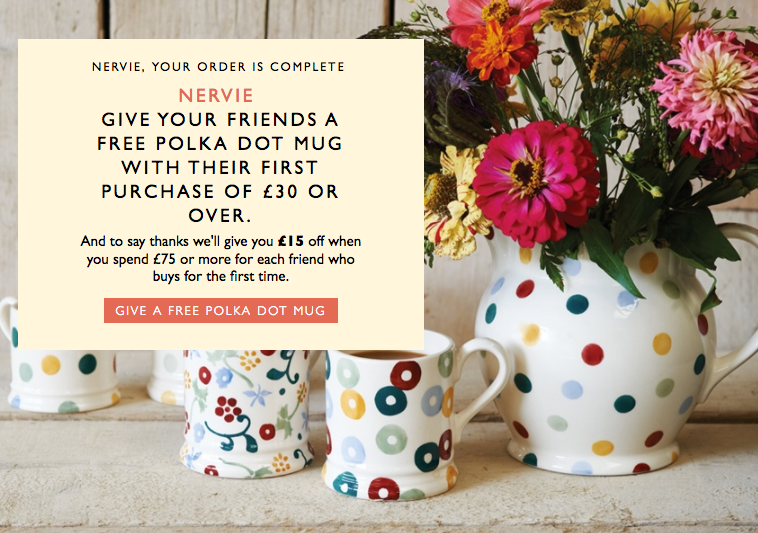 Read how the Emma Bridgewater Marketing Team used referral to give something back to their loyal customers in our case study. We’ve chosen a selection of Mention Me clients to illustrate referrals in the gifts and flowers sector, along with Photobox which we cannot claim credit for. In our experience this is another sector that is easy and popular to share. Helping a friend find the solution to a tricky present for someone who is hard to buy for is a powerful sharing dynamic. When your product is as photogenic as flowers or the lovely stationery offered by Papier then it makes sense to have beautiful graphic design at the heart of your customer journey. 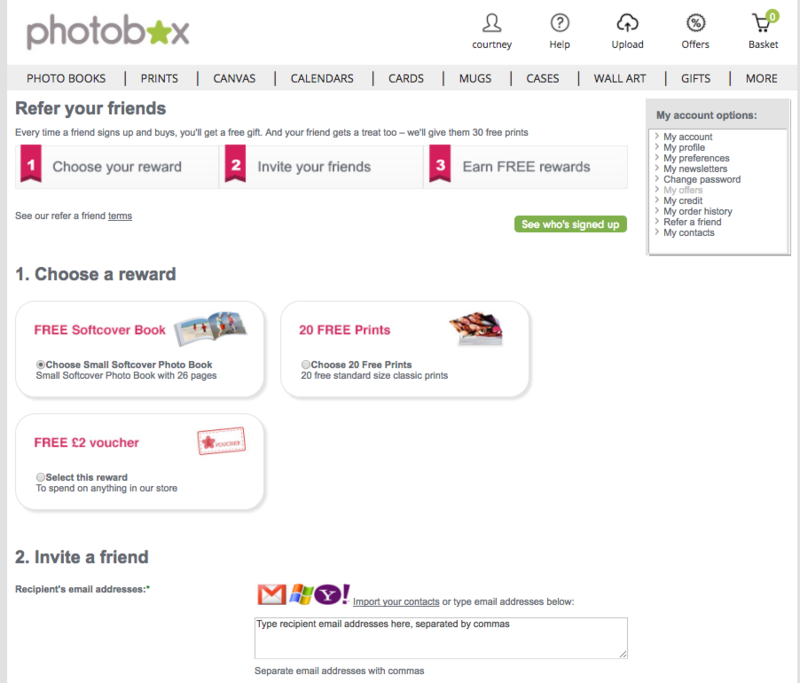 The Photobox referral programme offers some great rewards and a nifty little dashboard where you can track who you have referred but unfortunately it’s let down by some underwhelming graphic design. It is important to remember that customers view their recommendation as an extension of them - so anything that leads them to believe that their referral will fall flat can end up being a barrier to sharing. 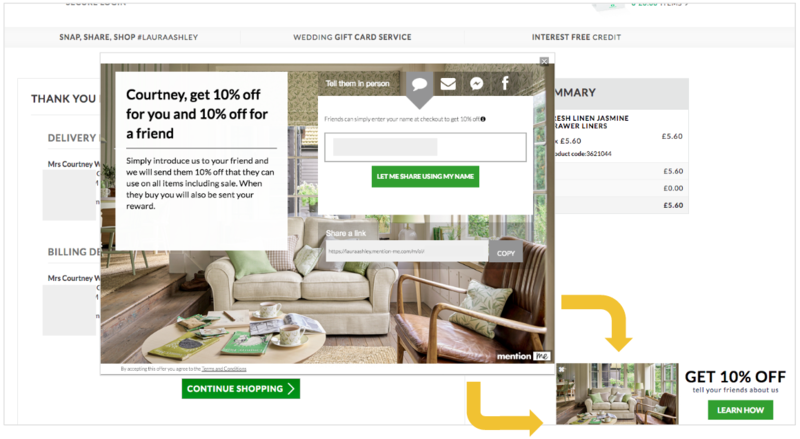 In this case, more aspirational design could help conversion. 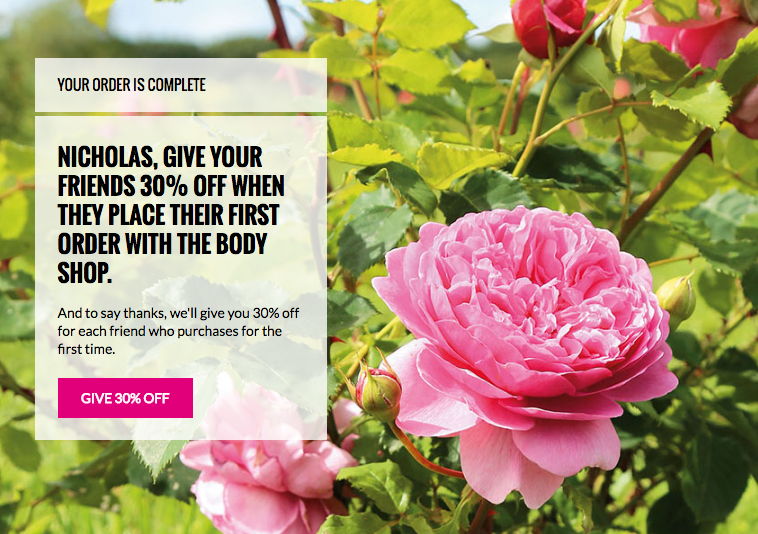 Bloom & Wild have really made great use of their happy customers to grow the business with referral. 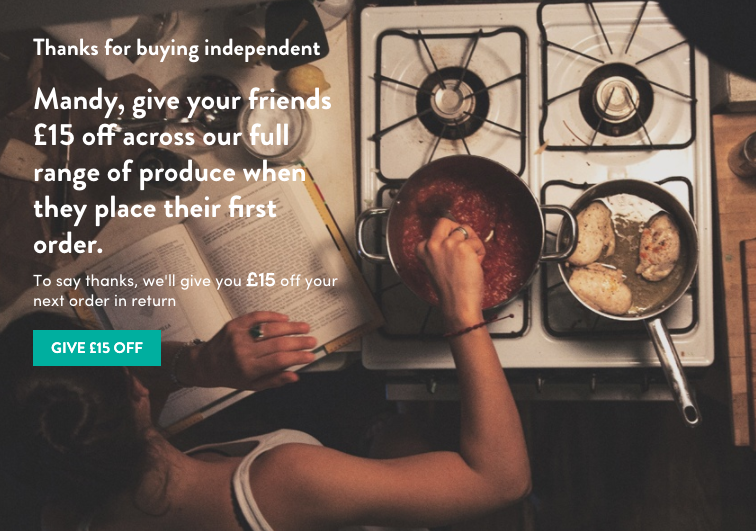 Read more in their referral marketing case study or watch a video of Aron, their founder, talking about how working with Mention Me has helped the business to grow. 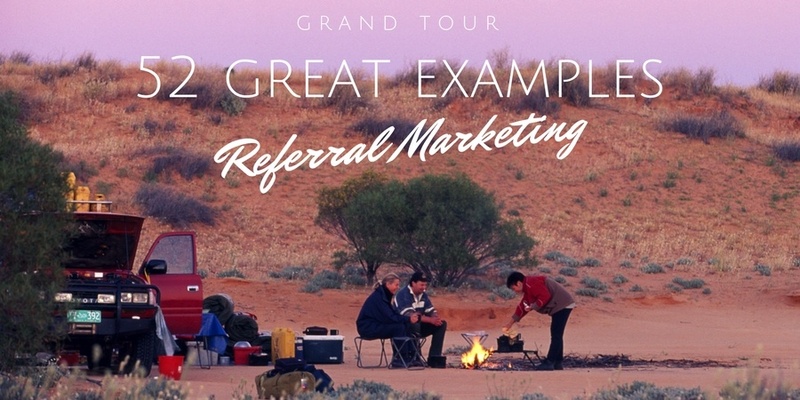 We’ve recently published a case study about how referral marketing works at Trouva. 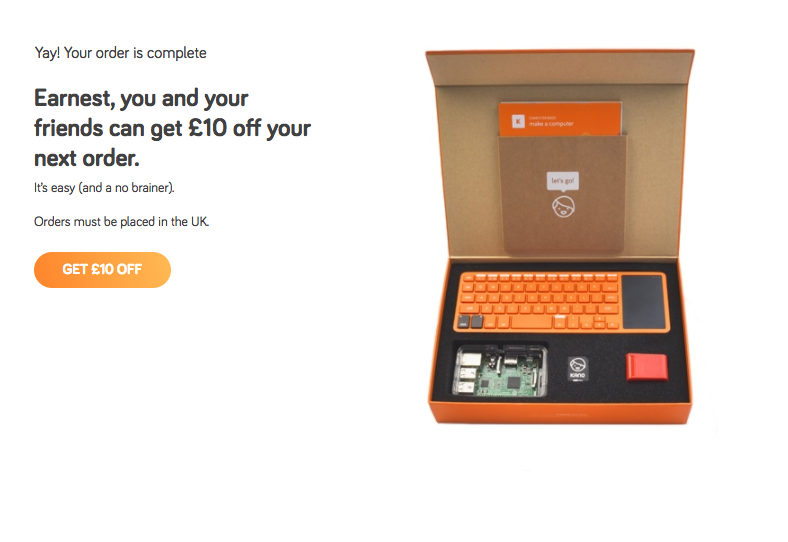 These examples are all pulled from brands offering subscription boxes. This sector has seen explosive growth in the past few years and is rapidly growing and maturing. We expect it to stay a hot area of ecommerce for the foreseeable future. 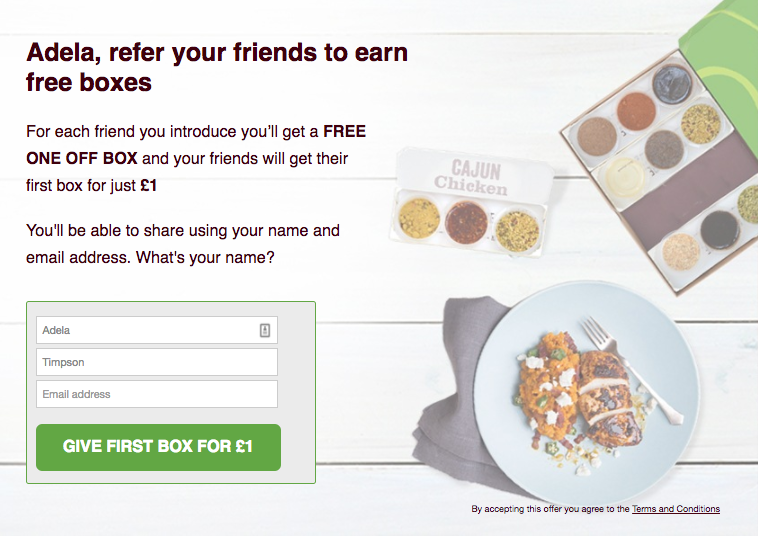 Referral programmes in this space tend to offer a free one off box or money off a box or subscription to encourage both sharing and trial. For the brands managed by Mention Me we see an above average share rate - the old stereotype is true: people do like to talk about food! But crucially as a sector which is innovating rapidly the food delivery market also gets a big boost from people’s natural desire to share things which are new and novel. Wiggle is very much the brand to watch in this sector and we must admit that we can’t claim their refer-a-friend programme as one of our own. 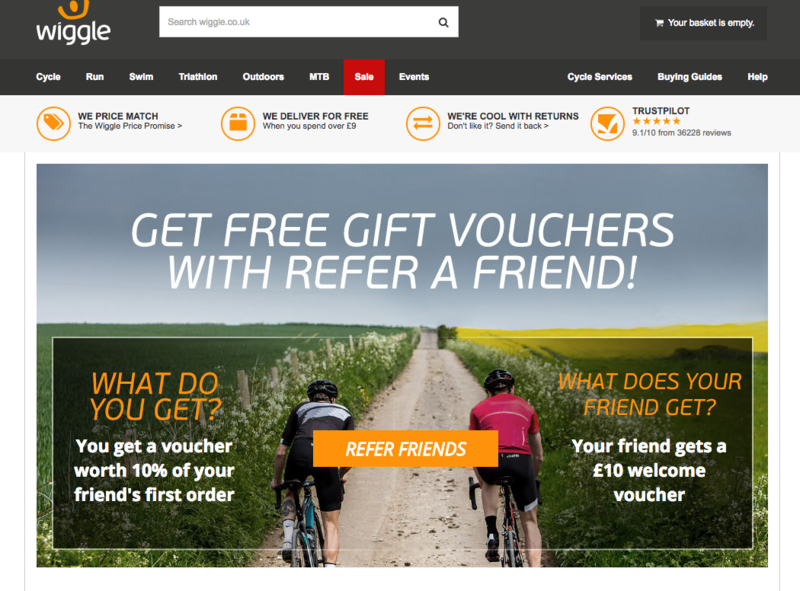 The Mention Me’ers love this brand though - partly because we’re a team of wannabe runners, cyclists and triathletes - but also because of their clever referral programme. 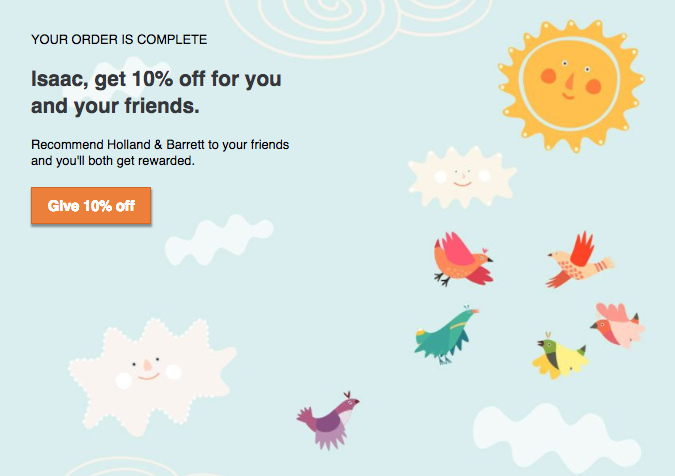 Wiggle offers the referrer a discount equal to 10% of their friend's order value - a neat way to get customers to encourage friends to buy higher value purchases through the site. Morvelo, Tribe and Ribble are all powered by Mention Me and all have slightly different characteristics. 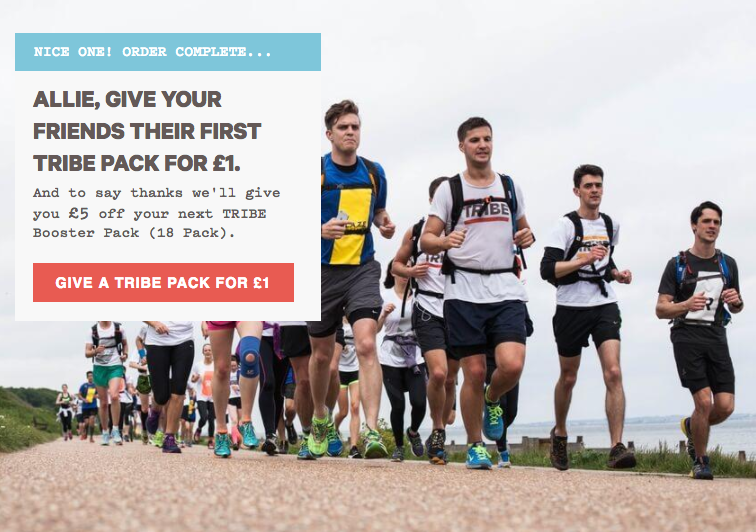 Tribe, a sports nutrition subscription service has a lot in common with the food and drink box delivery examples we listed above. 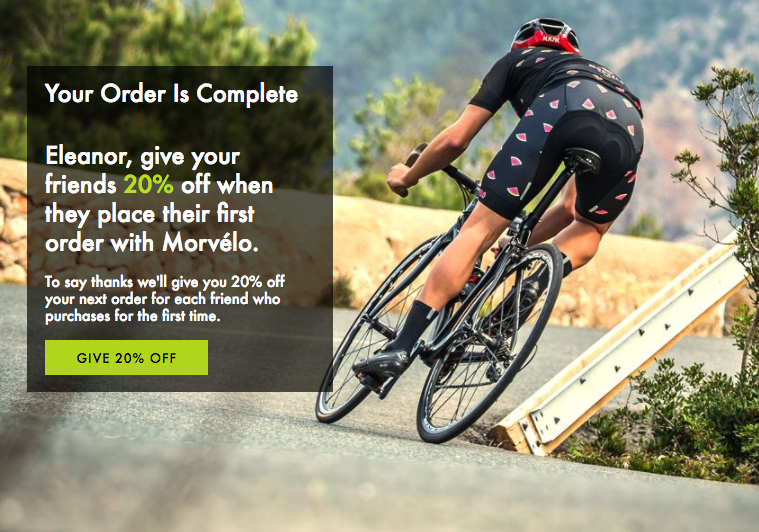 Morvelo is a specialist cycling clothing retailer and so shares some commonality with the fashion brands we covered at the start of this piece. 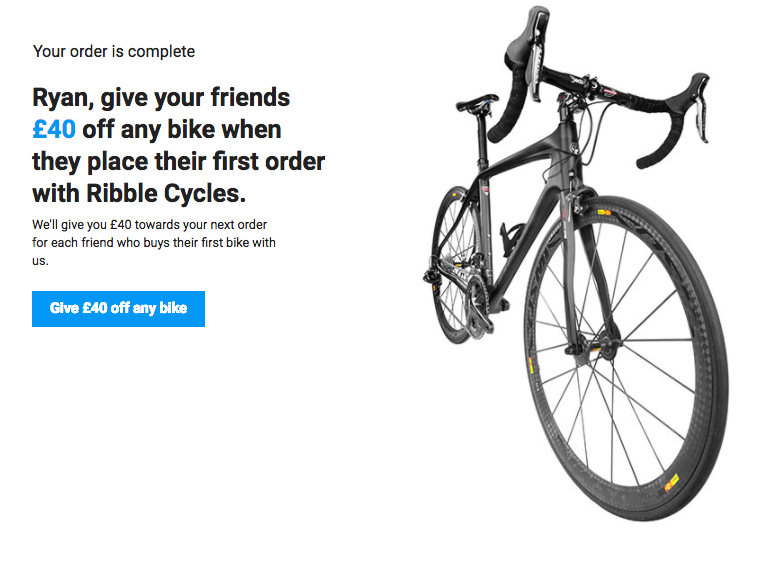 Ribble is a bike equipment specialist and their programme is configured with two segments: one for high value bike purchasers and the other for lower value components and gear. The difference between the two segments is the level of reward offered and minimum spend required. 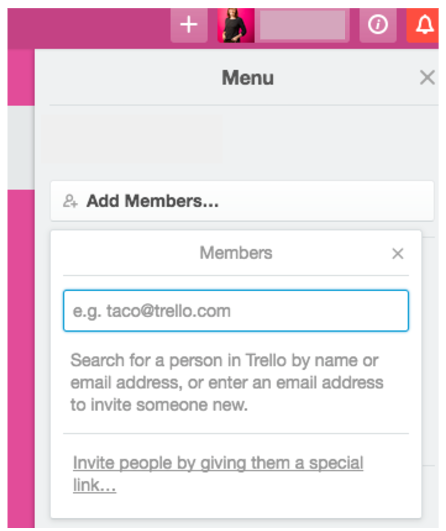 The Mention Me platform comes with built in segmentation capabilities - if you are interested let us know and we’d be happy to demonstrate them. And that’s it! Hope you enjoyed our grand tour of refer-a-friend programmes. It’s been epic but it really just touches the surface of all there is to know about how referral works in different sectors. Our team specialises in setting up and optimising referral programmes using our unique AB testing platform to drive learnings and improvements over time. If you’d like to learn more about Mention Me let us know. We’d be happy to give you a tour of the platform or you’re welcome to discover more about how the Mention Me Referral Platform works in our video.